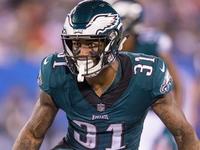 WASHINGTON — Philadelphia Eagles cornerback Jalen Mills was arrested on Saturday morning following a fight outside the Opera Ultra Lounge nightclub in Washington D.C. with Devin Robinson, an NBA player most recently with the Washington Wizards. Mills was placed under arrest for disorderly affray, a misdemeanor, and transported to the Second District Washington D.C. Police Department. According to the District of Columbia Courts website, Wills’ case type is "post and forfeit," which, in the criminal justice system in the District of Columbia, means a person charged with a misdemeanor can post and forfeit an amount of money to obtain a full and final resolution of the charge. According to NFL Network’s Mike Garafolo, the Eagles stated they were aware of the situation and are gathering more information. Eagles’ Carson Wentz has a broken back, report says, but did he play through it?